“Try this,” Capetonian Zayaan Khan (32) says, a headscarf draped loosely bandana-style over her cropped bob. It’s mushroom biltong, intense with the umami-like flavours of soya sauce, chilli, ginger and garlic. “We call it ‘sunstroke mushroom’. A friend has done a study that [shows] the skin of a mushroom can take UV light and convert it to vitamin D,” she explains. “I leave the mushrooms in the sun for at least four hours, maybe up to twelve hours so that they’re vitamin D-rich and that vitamin D will hold for up to a year. 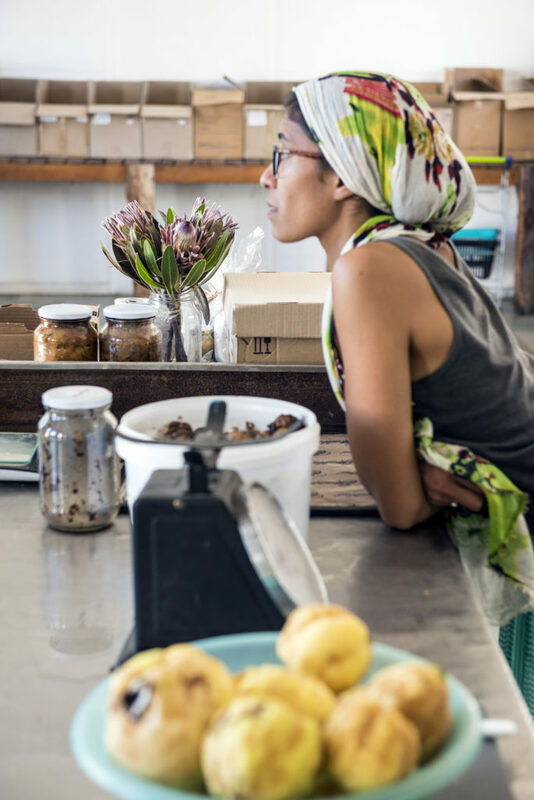 Then, I marinate them and I dehydrate them.” Zayaan is standing behind the counter of her current laboratory, the Ethical Co-op’s packaging room at Oude Molen Eco Village in Pinelands. Bottles of fermented vegetables like probiotic-rich kimchi and sauerkraut (“powerkraut because they give you superpowers,”) are steeping. Wonky quince and squash sit in large bowls. The sharp tang of vinegar and the sweet musky scent of dehydrated mushrooms fill the air. 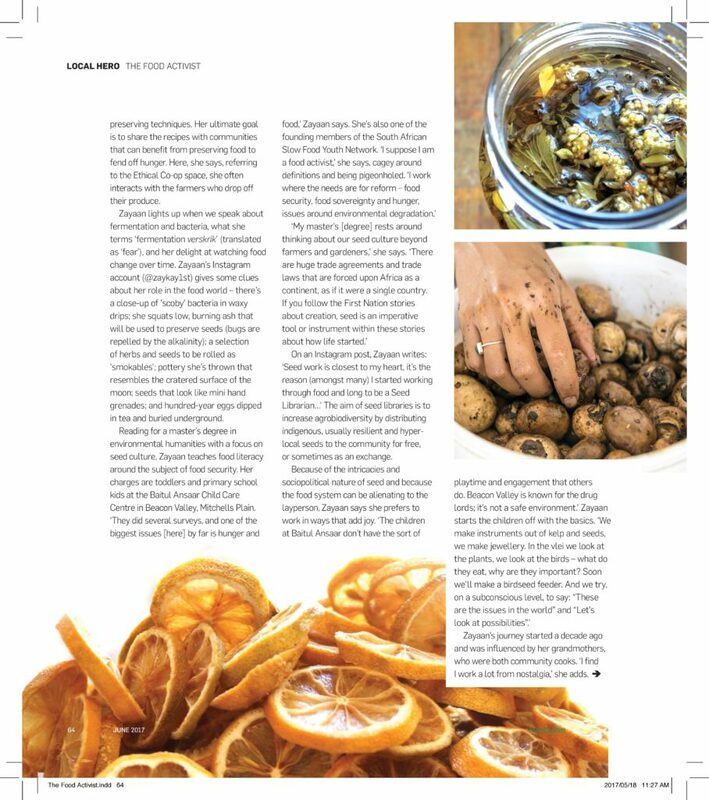 “I make brinjal biltong too,” she adds about the surplus and waste produce she works on with the aim of creating edibles that don’t require any special ingredients like sugar or pectin or complicated preserving techniques. Her ultimate goal is to share the recipes with communities that can benefit from preserving food to fend off hunger. Here, she says, referring to the Ethical Co-op space, she often interacts with the farmers who drop off their produce. Zayaan lights up when we speak about fermentation and bacteria, what she terms “fermentation verskrik” [fear] and her delight at watching food change over time. Zayaan’s Instagram account (@zaykay1st) gives some clues about her role in the food world – there’s a close-up of SCOBY bacteria in waxy drips, she squats low, burning ash that will be used to preserve seeds (bugs are repelled by the alkalinity), a selection of herbs and seeds to be rolled as “smokibles”, pottery she’s thrown that resembles the cratered surface of the moon, seeds that look like mini hand grenades, hundred-year eggs, dipped in tea and buried underground. On an Instagram post Zayaan writes: “Seed work is closest to my heart, it’s the reason (amongst many) I started working through food and long to be a Seed Librarian…” The aim of seed libraries is to increase agrobiodiversity by distributing indigenous, usually resilient and hyper-local seeds to the community for free, and sometimes in exchanges. In 2012 while she was working on land reform and food security issues with the Surplus People Project, Slow Food South Africa approached her to get involved in the then 1000 Gardens in Africa project (now called 10 000 Gardens in Africa). 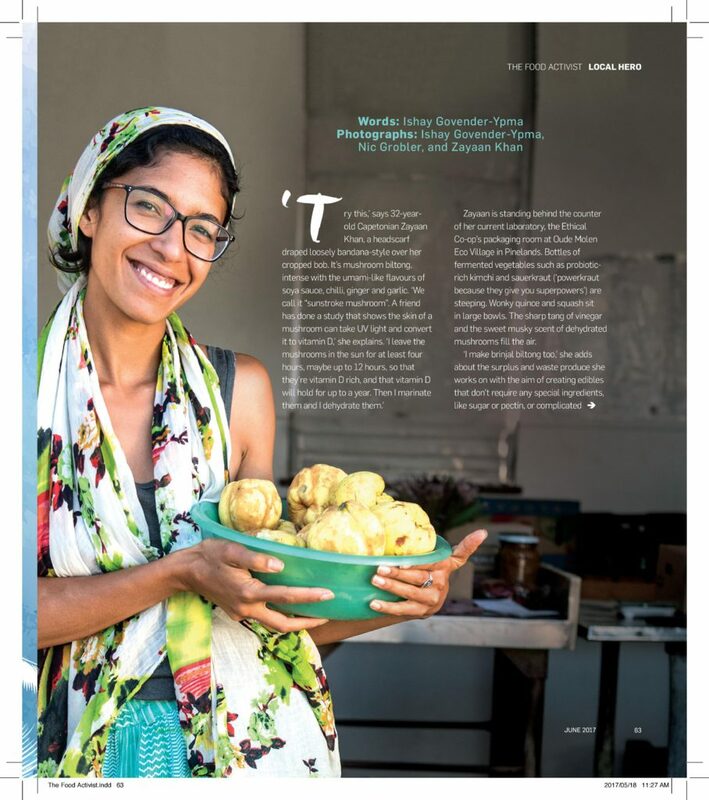 This led to Zayaan attending her first Terra Madre in Italy (a gathering of international Slow Food networks) and subsequently founding the local Slow Food Youth Network. “Terra Madre was a grand celebration of diversity, of indigenous people,” she says. “There was sharing of politicised knowledge and delving into why it’s politicised. I don’t think we were accustomed to that,” she adds. Locally, it wasn’t difficult to find people working in food who shared the same values as Slow Food. 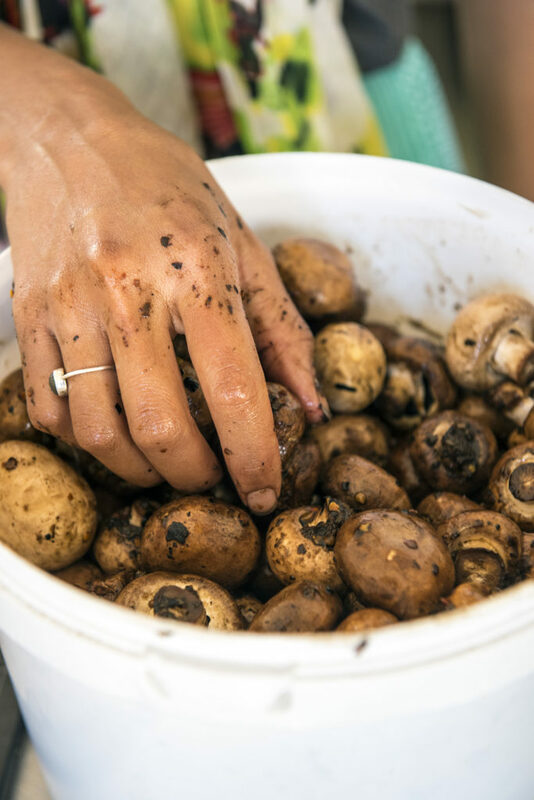 “One of the biggest challenges we faced was [finding] young farmers. We started by connecting within our own networks.” And thus, through friendship and sharing contacts, the South African branch was born. “We became friends and we inspired one another and that’s how we continued to mobilise young people,” Zayaan says. Xolisa Bangani is the founder of Ikhaya Garden in Khayelitsha, an educational community farm used to revive food culture. Known as “Brother Rasta”, he says, “I regard Zayaan as a daughter of the soil. I see her as a catalyst, a pioneer.” He adds that her gift for leadership has opened doors for many young, underprivileged people across the country. Featured in Khuluma, Kulula’s inflight magazine. love!!!!! thank you for this amazing article I & Z! !